Nu-Calgon 4296-60 Condensate Pan & Humidifier (water tank) Treatment, 200 Tab, Color Green (22NV26). Left untreated, condensate pans can suffer from the build-up of sludge, scum and other accumulations. This build-up can cause odors as well as plugged drains and overflows, which in turn result in water damage. 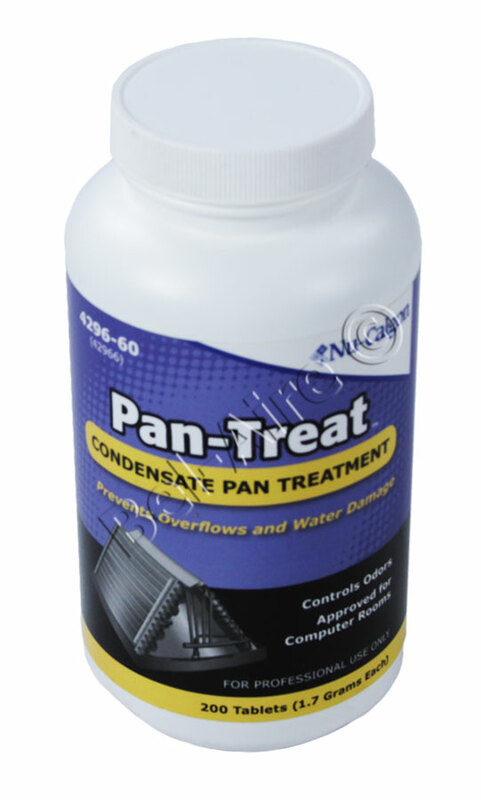 Pan-Treat is formulated with ingredients proven effective in cleaning and preventing these deposits, and its use will eliminate the extra maintenance costs associated with odors, mineral build up, plugged drains and overflows.